Not only is Seane Corn an incredible yogi and yoga teacher, she's also an amazing activist. I love doing her yoga DVD's. I always feel amazing after. Find out more about her here. 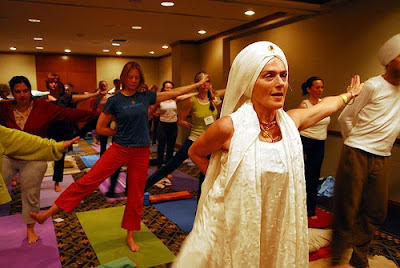 She is a Kundalini Yoga master, and an absolute inspiration. She must be in her 60's now, but you won't believe how she can move... She will whip you into shape (in a good way, of course!). See her site here. From Vancouver. He is vibrant, full of life and wonderful to learn from. His website has free yoga audio lessons that you can download. From here in Montreal. Her beautiful and physically challenging DVD has become an absolute staple for me. See her site here. Great tips! Did you catch the interview with Seane Corn on NPR's Speaking of Faith? It aired a while ago, but I got the podcast from itunes. Very inspiring; she discusses how she first got into yoga and her Off the Mat organization, and also the body prayer method she practices.